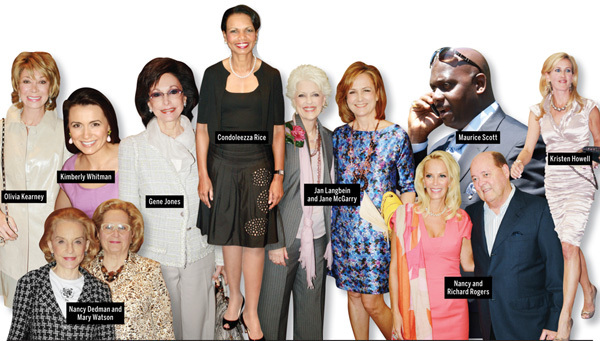 Condoleezza Rice dropped in the other day to keynote Genesis Women’s Shelter’s Mother’s Day Luncheon. It all started with a reception at the Anatole, where the VIS (Very Important Swells) lined up like families for Santa at NorthPark to have their pictures taken with the former secretary of state. Even presenting sponsors Nancy and Richard Rogers waited patiently with the rest. Then it was on to the Chantilly, where 1,800 packed the ballroom, requiring about 100 waitstaff to slice up cakes with the number 25 on top (the shelter is now old enough to rent a car). Genesis general Jan Langbein read a letter from honorary chair Laura Bush explaining that she would be a no-show due to book-selling commitments. Then she began shuffling through her papers and said she was supposed to introduce Condoleezza—but apparently she was wrong. Her confusion was so convincing that daughter Amy thought her mother had had a stroke. Then George W. Bush strolled onto the stage to do the introduction. People saluted with their iPhones, snapping pics of the former commander-in-chief. W charmed the crowd with cracks about Laura’s book being a perfect Mother’s Day gift. As Condi took the podium, Shrub settled into her empty chair. With Nancy Dedman, Kimberly Whitman, Nancy Halbreich, Lee Ann White, and Olivia Kearney sitting up close and personal, Condi gave an inspiring but nonrabblerousing talk about societies being judged by the way they treat women. Even the men in the audience didn’t feel threatened. Secret Service hunks on the sidelines registered no reaction. Then it was time for rest and a change of outfits, and on to Kathy and Harlan Crow’s place on Preston for an exclusive reception. The intimate gathering took place in the library, where guests were surrounded by two stories of 8,000 rare books (first editions by Benjamin Franklin and Isaac Newton) and a few tchotchkes of mild interest (Lincoln’s death mask, Duke of Wellington’s sword from 1815, Babe Ruth’s duffel bag). Alas, just as Condi was about to address the crowd (Nancy and Ray Hunt, Jane McGarry, Carmaleta Whiteley, Lee Bailey, Annette and Harold Simmons), her wireless mic went on the fritz. Not to worry. To the surprise of no one, she rose to the occasion and spoke loudly enough for all to hear. Nicely done, Condi.